Native to the Mediterranean region, Milk Thistle (Silybum marianum) is indigenous to both western and central Europe and is now found in the United States. An annual or biennial herb growing up to 10 feet tall, Milk Thistle has a large bright purple flowering head. It is often considered a pesky weed. It gains its name from the milk white veins that streak its prickly-edged leaves. The plant contains the natural chemical substance Silymarin, an active constituent highly concentrated in the fruit, but also found in the seeds and leaves. 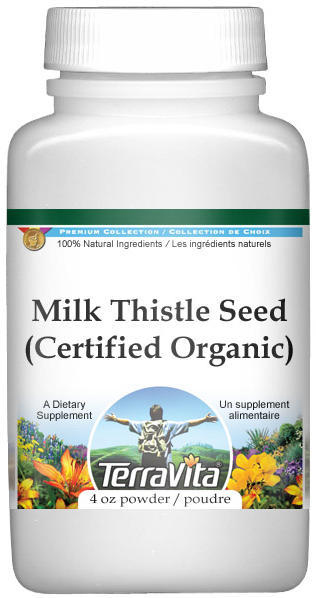 Milk Thistle has been used as both a food and a health aid for hundreds of years. Milk Thistle can be used to help support numerous digestive disorders but may also act in protecting the liver from toxins and health issues. It has a long history of effectiveness as a liver tonic supporting a healthy liver and jaundice. The potent silymarin extract from milk thistle is protective against many types of chemical toxins. The extract may act as an antioxidant, can help improve liver function, help stimulates regeneration of damaged liver cells, avoids the formation of damaging leukotrienes and protects the kidneys. It is also helpful for adrenal and inflammatory bowel disorders, adrenal disorders, weakened immune systems, and psoriasis.